And a very happy Easter to you, too! 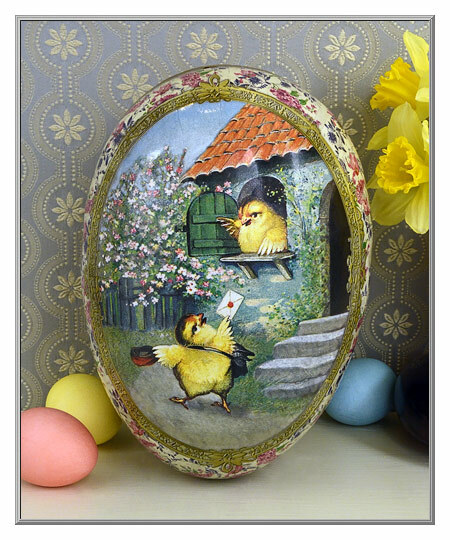 An adorable Springtime picture of cheerful yellow chicks, this grand egg features an image that dates to Victorian times. So large that it will hold lots of treats, this egg gift box can even be used in place of an Easter basket. 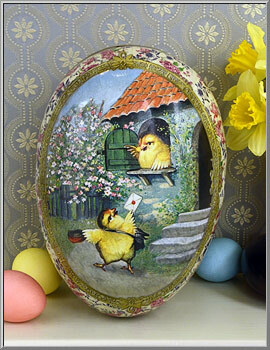 Made from sturdy, pressed cardboard, the extra-large egg has the same colorful image on both sides. From Germany. Sold as one egg box. by 6½" wide and is 6½" deep.